We love excellent audio quality here at T3.com and, as such, prize a really good pair of headphones. Our favourite sub-£100 headphones are the AKG Y50. They represent stupendous value for money. Don't expect Beats levels of bass, but you can choose from several fantastic colours. As well as the excellent sound quality, the Y50's cable is also a decent length, while there's also a soft travel pouch, too. Unfortunately, more often then not though, to get top shelf audio fidelity you need to drop hundreds if not thousands of pounds on a premium set of cans to avoid falling into a plasticky, tinny trap. There are, however, plenty of options under a ton that deliver great sound quality - you just need to know where to look. Here T3 has rounded up what we consider to be the best headphones currently on the market that cost less than £100, with both wired and wireless options to choose from. Remember that many over-ear headphones are open-backed. Open backs leak sound like a sieve, which means that wearing them on public transport isn't the best idea if you want to remain friends with your fellow passengers. These are the best sub-£100 headphones to buy. For the money these super slick cans from AKG are just fabulous value. The Y50s deliver an on-ear pair of headphones equipped with a smart 3D-Axis folding mechanism, detachable 1.2-metre cable with inline, one-button remote/mic and solid speaker frequency response of 16 Hz to 24 kHz. Throw in a 3.5 - 6.3mm adapter and soft travel pouch, as well as the ability to choose from four different earplate colour schemes, and these are a super attractive option. Wireless, colourful and packing 50mm drivers, the JBL E55BT offer an incredibly attractive package for those looking for good audio at an attractive price point. Indeed, a tasty 20-hour battery life as well as multi-device connectivity - with seamless switching between devices - innovative fabric headband and more can be yours if you plump for the E55BT, with the set also rocking very comfortable ear cushions that make extended use a pleasure. At a tenner shy of ton, we're not sure what else you could want. Next up we have this pair of cans from Sony. 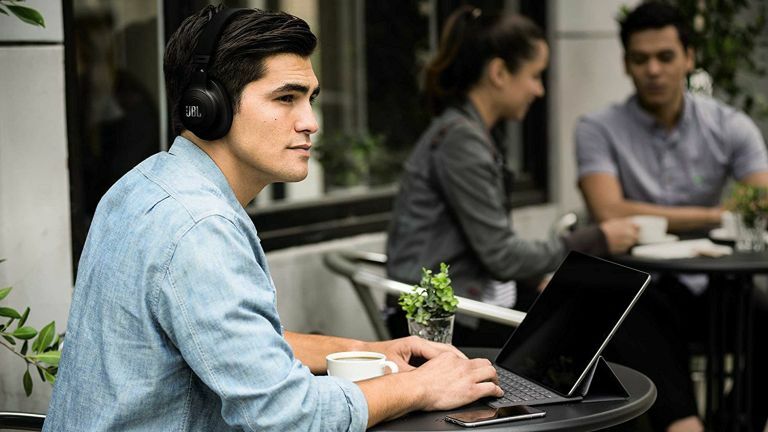 The not very catchily named MDR-XB650BT deliver a tasty 30-hour battery life, 30mm neodymium drive unit with Sony's Bass Booster technology for extra punch at the low end, super soft ear cushions, one-touch NFC pairing and a swivel ear cup design for easy portability. You might wonder why the Sony is below the JBL given that it looks better and boasts even longer battery life. It's because it's very hard to get bass levels 'just right' – they're too low with Bass Boost off and pretty thuddy with it on. Athough obviously, if you are quite literally 'all about that bass', get stuck in. There are three different colour schemes to choose from, with this blue set being T3's favoured hue. Bowers & Wilkins headphones tend to be very much in the 'Best headphones over £100' category usually, but these now sneak in just short of a ton. You see these all the time in art galleries and museums when audio is required, and that's because they are an audio work of art, delivering everything you would expect from a premium audio manufacturer's headphones. They sound precise and punchy even with lower quality MP3 but really come into their own with better sources. They are way more forgiving than the other audiophile option here, the Grado. The P3 has a stylish and minimalist design that beautifully combines aluminium and custom fabric for a premium finish, is partnered with a mylar damped laminate diaphragm, neodymium magnets and dynamic driver to deliver super sound quality and, for the price, unparalleled class. If you demand something a little different from your gadgets, then the Creative Outlier should appeal to you greatly. Indeed, these cans can play audio from four different sources, via Bluetooth, a built-in MicroSD card port, USB and AUX-in, meaning that no matter where your music is stored, you can listen to it with ease. Each set of Outliers also come with a selection of coloured accoustic rings, allowing you to customise your look as you see fit. Battery life isn't as impressive as some other headphones in this guide, however at 10 hours you've still got plenty of juice to rock out morning, noon and night. High-resolution, wired, on-ear headphones, the ATH-SR5 delivers a lightweight and flexible swivel design, soft memory-foam earpads and headband, smartphone detachable cable and, crucially, top sound quality via its 45mm diameter drivers. The quoted frequency response of 5-40,000Hz seems slightly moot but it certainly doesn't sound compressed. As you would expect from Audio Technica, the build quality of the headphones is also on the money, with the set weighing in at 165 grams. An included carrying pouch allows easy portability too. Extras like a non-resonant air chamber and dynamic transducer mean that the SR80e delivers great playback. Note that these cans are quite 'audiophile' in nature, and don't gloss over failings in your source material as well as many of the other options here. With good quality audio files, they shine, however. There's really not much to dislike here with the Beats EP On-Ear Headphones. For a start they ring in for less that £70, secondly they come in four solid colourways - Black, Blue, White, and Red - and third they deliver Beats' usual audio performance, which is to say, pretty kicking. The adjustable sliders work well, making it easy to fit the headphones to different head sizes, while the inline RemoteTalk cable is premium grade and allows the wearer to take calls and control the music with ease. A battery-free design also means you don't have to factor in power level and charge time, with the EP ready to play whenever. Geared towards more of a studio usage, however in no-way restricted to it, these badboys from Shure deliver a closed-back, circumaural design that both sits well over the ears and works to reduce background noise. A dynamic transducer, 5Hz - 25kHz frequency range, and 40mm driver ensure precise performance across bass, mid-tone and treble too, while small details like a bayonet clipped cable and replaceable ear cup pads mean that you'll feel comfortable wearing these everyday in a variety of situations.